Environmental Protection Agency Administrator Scott Pruitt has signed a proposed rule that would restrict the types of scientific studies regulators can use to determine the impact of pesticide and pollution exposure on human health. Pruitt says the change would increase transparency in the agency’s decision-making by requiring all underlying data used in scientific studies to be made publicly available. Critics, including former EPA administrators and scientists, say Pruitt’s move is designed to restrict the agency from citing peer-reviewed public-health studies that use patient medical records required to be kept confidential under patient privacy laws. Pruitt would be “walking into a judicial minefield" if he tried to stop the E.P.A. from considering certain studies, says Richard J. Lazarus, a professor of environmental law at Harvard who spoke with the New York Times. 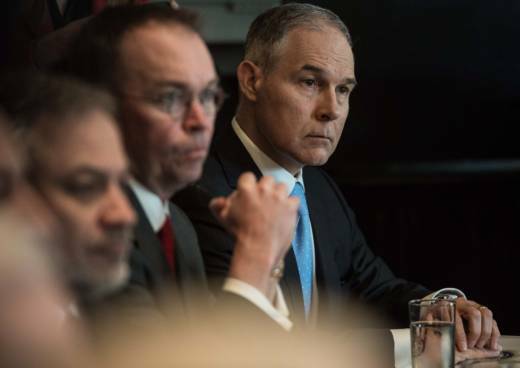 The embattled EPA administrator signed the proposed order at EPA headquarters Tuesday in an event that was livestreamed on the agency’s website but not open to press coverage. The NYT, which obtained an advanced copy of the proposed regulation, reports that the public will have 30 days to offer comments on the measure before a final rule is issued.